So, one day, Peaches was outside and decided to sit on a rock, just enjoying herself. Then, all of a sudden, she notices there is a caterpillar crawling on her. She didn't see it come on her. It's a good thing Peaches likes caterpillars. She just let it crawl on her for a long time. Merry Christmas! 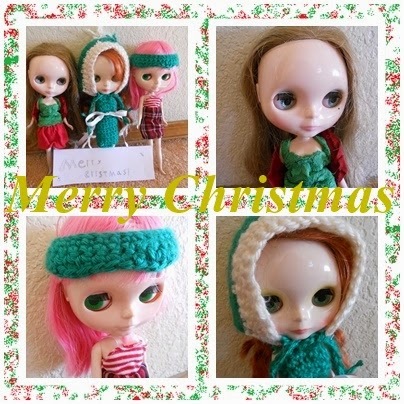 Me and the Blythies wish you happy holidays! Hi everybody!!! Today, Kiki went to the theaters and watched Annie. She loved it. Up above is a picture of Kiki posing (kinda) by a cardboard Annie posterish. Here are all my Blythe dolls that come with Littlest Pet Shops. I've been collecting them for a while (before I started collecting Neo Blythe dolls). I haven't got much this year, though. I've been focusing on Neo Blythes. Here is Pandora. She's my first one. In the second picture, Pandora is with Sophie, the cat. Sophie's eyes look weird in this picture. Here's Amber, the only mini Blythe without bangs... so far. Here's Scar. He's my only boy. I made the hair thing, the shirt and the skirt on Mable. I made the shirt on Zyla. I also made Amber's dress. She has a skirt over the dress - that I did not make - so the dress just looks like a shirt. Kiki came to the grocery store with me and there was a Bob the Builder ride that Kiki loved. She doesn't like babyish stuff but she likes the babyish rides at the store. It was cold outside so Kiki got to wear the newish hat and the oldish warm pants. Also, Kiki went to the movies with me. We saw "The Hunger Games: Mockingjay - Part 1." It was cool. Here is a picture that Kiki took while she was on the ride. Hello and happy December! Hope it's a nice one. Here are some pictures of Josie that I took a couple months ago.